Whirligig Bug: Can You Hear Me Now? 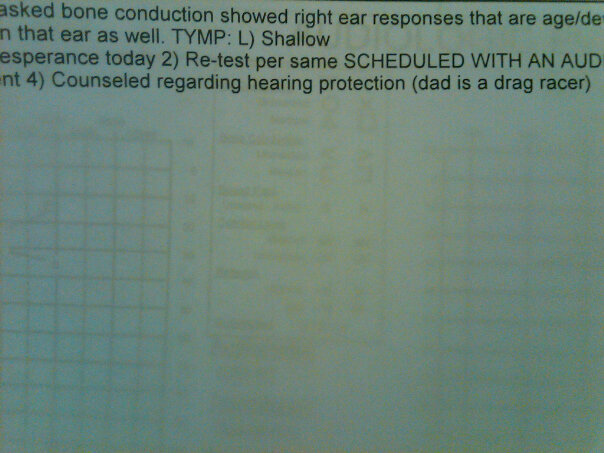 Rachel had her hearing test this past week and she did great! From now on out we will simply monitor and test her "good" ear every six months to make sure it's working properly and hearing what it should be hearing. Rachel is hearing at an age-appropriate level. They did do some bone tests on her right ear, and we were told again, if sound could get to her, she could probably hear. I'm always very nervous at these appointments not only about the results, but how will my daughter behave, will she want to be napping, will she be hungry, what if we have to wait FOREVER in the waiting room, etc. Well, this time, I forgot the stroller, so here I am in the parking garage, lugging a 7 month old, a diaper bag and a toy bag and trying to mentally note where I am, which elevator I am entering and where I parked the car! Then once I get inside, I need to be sure I am on the correct level and make it to the correct reception area! This time it went smoother than I imagined, but next time I will be sure not to forget the stroller! We always receive the results of Rachel's tests before we leave and this time was no different. While waiting to meet with the doctor, I skimmed through the paperwork and showed my husband the last sentence (number 4) of the report below. He was so excited, he had me take photos of it and he instantly posted it on Facebook. Yeah, I think he was just a little excited that he was racing that weekend. Here she sits on her dad's lap in the "sound room" and the audiologist watches her from the window to see what sort of reactions she makes to sounds. She was getting a little fussy so she was sucking on her pacifier and often stopped sucking and looked up when they tested her nemo ear.